Debate on tempered glass vs. Gorilla Glass is heating up. Unbreakable screen protectors guard mobile phone screen from scratch, dust, water and oily substances. Let’s learn the difference between these two types of glass. Touchscreen mobile phones, are nowadays common use devices. It is important to protect touch screens as phones don’t work properly if these screen are damaged. You may have heard of terms like “Tempered Glass”, “Gorilla Glass” and “Dragontrail” screen protectors. For those of us who aren’t familiar with phone protection, the terms may sound alien. Therefore, today we have decided to publish some basic information about screen protectors. 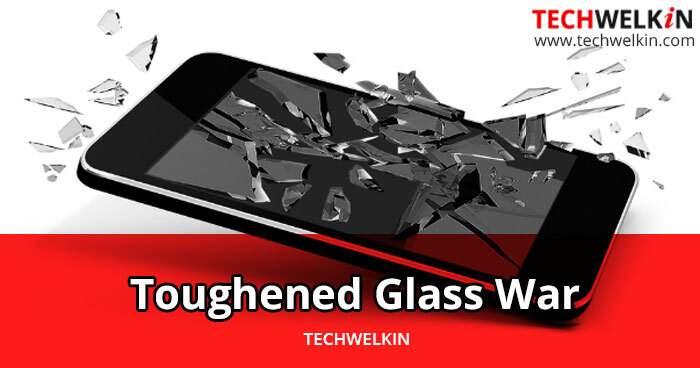 We will talk about difference between tempered glass and Gorilla Glass. We will also see what these screen guards do for your phone, and whether or not they are worth the price. A screen protector is meant to protect a phone’s screen from water, dust, fingerprints, oil, shock, scratches and a fatal fall. They are also meant to increase the efficiency of the screen by providing a smooth surface for ease of scrolling with fingers and better light transmittance for a clear display screen. Tempered Glass is made by heating the glass and then cooling it very quickly. This type of glass breaks differently than normal glass. A tempered glass protector is a multi-layered screen protector. It has a bottom layer of absorbent silicon, PET film and an optically clear adhesive tempered glass and oleophobic coating in that order as displayed in the following illustration. 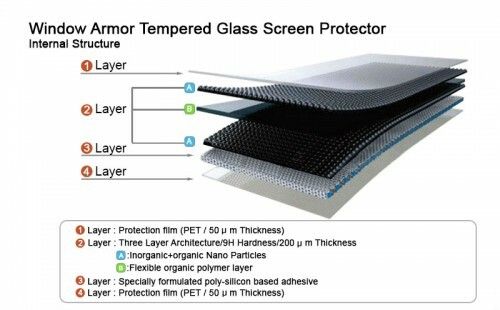 All these layers make tempered glass up to five times stronger than normal glass. Gorilla Glass is a brand of specialized toughened glass developed and manufactured by Corning. It is thin, light and damage resistant. Gorilla Glass is used as cover glass for portable electronic devices, including mobile phones. Now we know what are tempered and Gorilla Glass screen protectors and their specifications. Now let us compare the two and observe the differences. Developed and manufactured by Corning, USA. Developed and manufactured by many small companies mainly in China. Available in different versions like 2.0, 3.0 and 4.0. Depending on the manufacturer, the price and quality differs but there is no version as such. Used as cover glass for portable electronic devices, including mobile phones, portable media players, portable computer displays, and television screens. Used as a protective cover for smartphones and tablets only. Some of the latest smartphones come already fixed with the Gorilla Glass protectors. Usually you need to get tempered glass protector fixed/installed on to your smartphone. Scratch and damage resistant. Only some rare metals, sand and diamond may cause scratches. Scratch proof, shatter proof, responsive touch. Comparatively thicker than Gorilla Glass. Does not contain oleophobic coating Better quality tempered glass protectors include oleophobic coating. Cannot be replaced or reused. Can be replaced with a quality of your choice and the older one can be reused on other phones with matching screen size. Phone price is inclusive of the Gorilla Glass cost. Price may vary depending on the quality of the tempered glass screen protector you choose. So which glass is better? As the end user you need to decide and opt for the best. Gorilla Glass is manufactured by a renowned manufacturer and so many people vouch for its strength and scratch resistance properties. While others vouch for the tempered glass protectors and the argument is that it is used on the Gorilla Glass screens for even better protection —so it is superior. It is debatable, right? Screen protectors are not a must-buy item anymore. The latest smartphone screens are equipped with scratch and damage resistant qualities. Besides, your phone’s life and condition depends on how you handle it. Nothing is foolproof. Smartphones are expensive. So it is good to spend an additional amount for the screen protector, rather than spending a huge amount to fix the cracked display screen! for ASUS Zenfone Pro M1 which screen protector is best ? Can I use gorilla glass protector on Samsung S9 and fit it with an Otter box Defender case. Will both work and fit together properly? Is it possible to buy Gorilla Glass for other things besides cellphones, computer screens & TVs ? My guess is that it should be possible. You should contact Conning for this.